Not only is Nintendo's legal action against R4 cart spiking the sales, it's also spiking the prices. Check out this Akihabara retailer on July 29th when the news was first announced. R4s were going for ¥2,980 (US$28). 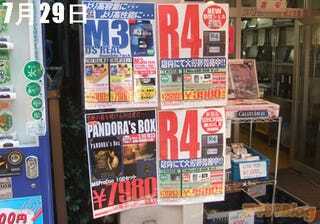 The following day, the price jumped to ¥4,980 at the same retailer. And today? This shop's price hit ¥5,980 ($55). Pics of that after jump.